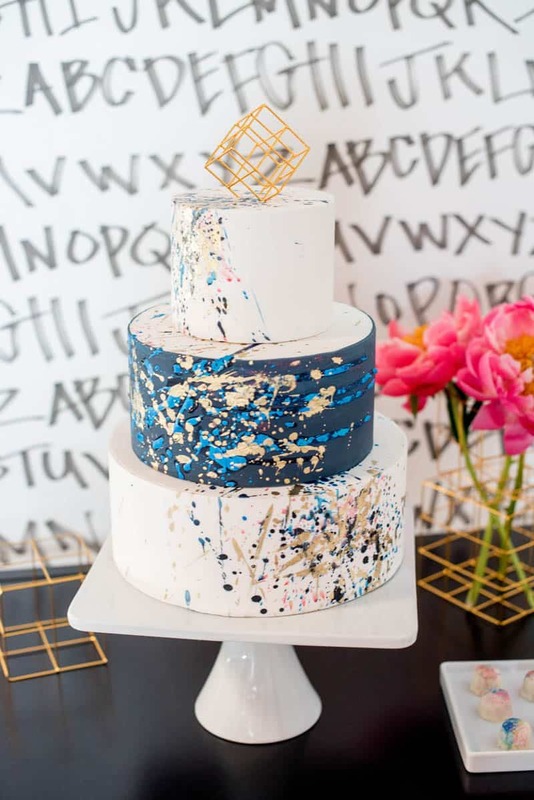 Wanting to be among the first vendors and “wedding” in the space that opened just two months ago, this very talented team of popular NYC vendors came together to create this Jackson Pollock inspired, vibrant inspirational shoot. “Dobbin St is the hottest new venue in New York City, located in a very trendy area of Brooklyn on in Williamsburg.” Leah told us. “The color palette was chosen to play off the already amazing curated art and colors in the venue: black and white with pops of yellow, mauve, green and blue (“Yves Klein blue” particularly on the front exterior statement wall, a color first mixed by this famous artist around 1960.) Everything in the shoot played off those colors, with an addition of Pollock-like splatter paint throughout particularly on the dinner plates, cake and guest book paper. Two other well known artists are highlighted at the venue including Christine Gedeon who created the mural on the back wall out of tape, inspired by an aerial view and side view of the Manhattan/Brooklyn landscape as seen from the venue’s rooftop, and custom wallpaper by Brooklyn native Sarah Merenda.” She continued.